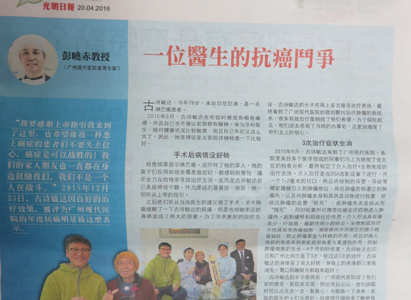 On April 20th 2016, Malaysia Guang Ming Daily published an article about Modern Cancer Hospital Guangzhou which introduced the anticancer story of Indonesian lymphoma patient Koesminitarti Prasanta. Koesminitarti Prasanta is 78 years old now, after taking interventional and natural therapy in MCHG, her condition turned better, and her pain disappeared, sleep and appetite returned to normal. Koesminitarti Prasanta comes from Palembang, Indonesia, is 78 years old now. In June, 2015, she felt painful when swallowing food and did not feel energetic as before. As a dentist, she is sensitive to her health and she is old so she thought to take a further check-up in hospital. However, the result showed that she had lymphoma. The bad news shocked her family and her children felted scared and worried about their mother’s condition so they spared no effect to look for cancer treatments; while Koesminitarti was calm because she listened to God’s guidance as a devout Christian. They took local doctor’s suggestion and she took surgery. Through surgery alleviated the pain, it also caused a big trauma to her body in old age. In order to pursue a better treatment, her son searched more treatment options on the Internet and he found minimally invasive targeted therapy for cancer in Modern Cancer Hospital Guangzhou. Many successful cases brought them hope. They decided to visited branch office for a further consultation and they strengthened their confidence to take treatments in Modern Cancer Hospital Guangzhou at there. In September, 2015, Koesminitarti arrived at Modern Cancer Hospital Guangzhou. MDT (Multidisciplinary team) immediately took a further check-up for her and analyzed her case. Finally, they worked out a therapeutic plan of interventional therapy and natural therapy for her. Interventional therapy has the advantages of little pain, high efficacy and few toxic side effects. Biological natural therapy can not only kill cancer cells, remove the residual disease, prevent the recurrence and metastasis of tumor, but also restore and rebuild patients’ immune system and inhibit the growth of human cancer cells. In four months, Koesminitarti has come to our hospital three times. After taking three sessions of treatment, her condition is obviously improved and the pain has gradually alleviated. Appetite and sleeping is getting better. During the interview, her eldest son told us that Modern Cancer Hospital Guangzhou made them feel at home. There are garden in the hospital and the hospital is near Baiyun Mountain where they could go for a walk and take regular exercise. Doctors and nurses are amiable and they care about his mother’s daily condition and always encourage them to keep a positive and optimistic attitude to fight against cancer.